Here’s the last of my beach looks. I’m so happy I was able to squeeze in a Labor Day weekend vacation. When you’re living such a fast-paced lifestyle, you have to grab every opportunity to let loose and just kick back with friends. I’ve been so busy I’ve already lost track of dates even! I needed this. I needed a breather. Is it just me or is this year going by so fast! Wasn’t it just yesterday when we welcomed the new year? It certainly feels like it! But, this is good right? It only means I’ve been so busy and I’m living life to the fullest. They say you should take your time while you’re still young. I say make the most out of your youth! This is why I can really relate to Smart’s Live More campaign. There really is no time to waste. Smart says, “Your time is your life, and the less of it you waste, the more of it you live.” So true. Haven’t seen Smart’s new TVC? Watch it below. I’m sure you’ll be able to relate! FYI, the song in this TVC is entitled “It’s Your Life” composed exclusively for Smart by international artists James Banbury (who has worked with U2, Depeche Mode, Snow Patrol, etc.) and Pete Davis (who has worked with Gwen Stefani, Bjork, Spice Girls, etc.). You can download it for free here. You can even make it your ring back tone for free by typing LIVEMORE and then send to 2728. P.S. I just found out I’m nominated as Top Female Online Entrepreneur for AVA. I hope you can vote for me by liking my photo here. Thank you! i love your outfit! perfect for the beach but still classy and you, and not to mention, unique! it’s really amazing to me how you seem to look awesome and be so put together everyday! isn’t it tiring, especially to have to think of what to wear everyday? Thanks Z! I have my lazy days too! :) But I really love dressing up so I really put effort to it! Looking good! 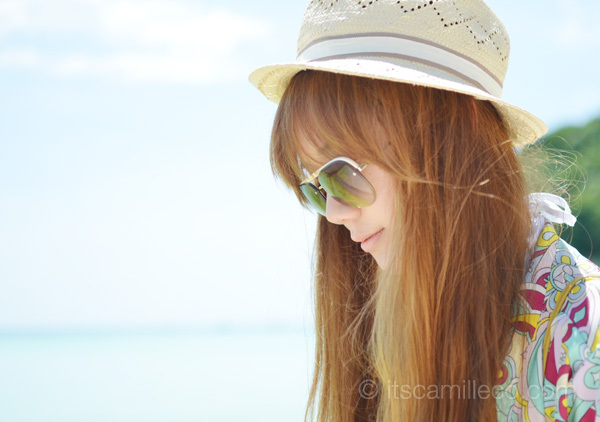 How do you protect your hair from the sun and water? I don’t! Maybe that’s why it’s so damaged already haha! i also visited krys’ blog and i think you really had fun! you guys are awesome! i always visit your blog, as well as krys’ and laureen’s.. muah! Thanks Sienna! I love those 2! :) It’s a riot whenever we’re together! I love your beach outfits! Goes to show how classy na classy ka pa rin wherever you are :) and you have the prettiest sunnies! You really inspired me a lot..You have such a good fashion sense..I’ve been following your blogs since I first saw you on LB last year..My friends and I admire you a lot. I’m your fan!hehe! I hope I could meet you the next time you’ll have a Bazaar with your friends Kryz Uy and Lauren Uy. And hopefully could buy and own some of your clothes, shoes, bags and accessories. Love ’em!All of you are such an inspiration. Love your style.. Remember though, all work and no play, makes Camille have a grumpy day. Hahaha true, grumpy day indeed! :) I don’t have a method. I just don’t sleep haha! I kid. ur so pretty darling! your style is always chic and fab!! You really don’t run out of clothes! LOL. I know you said you don’t have an endless closet haha, but things always come in hehe. You are awesome! Oh and good luck to that new contest. I’m rooting for yah to win! Thanks Chai! Happy mothers’ day to your mom as well! Camille, you are an inspiration to me.. I’m currently a student and i also hope that someday i can have branded items like yours. I will work hard to earn money for ’em. You seem to own almost all of the branded luxury bags and shoes! Lucky girl! I have a question, are those luxury bags and shoes all yours or you sometimes borrow from your mom and sister? ’cause sometimes i just borrow from my mom. Huhu. I can’t afford them yet. Thanks Camille for being an inspiration! God bless! Haha I borrow from them a lot!!! :) Thanks Pao! You genuinely seem like a nice person. An extra stylish person that is. I was wondering on other blogs that you read. Those similar to yours a personal fashion blog. Could you share them out with me so I know where you get your inspirations from. You are my inspiration. i was browsing through your blog when my mom saw me. She saw a few looks and now, SHE’S HOOKED! she won’t even let me use the computer now coz she’s still busy looking! and every single day she goes like “hey, my bagong post na ba si camille” haha! Love your beach look! Colorful and greatttt…. Stunning as always! Happy Mom’s day to your mom Ms. Camille! Thanks Jaszel! Happy mother’s day to yours too! You look lovely, I adore the whole outfit! Awww thanks Princess! Sweet! Dreams really do come true. Best of luck with your blog!